Our sailors have deployed the drifter buoys and Argo floats that they loaded onboard when they departed from the United States. ‘Deploying’ is just a grand term for putting them carefully into the water from the side or back of the boat. Drifter buoys and Argo floats are expensive, sophisticated bits of scientific kit, but at the end point it is just a simple moment, a careful placing in the water by an ordinary sailor, not a scientist or an expert. An ordinary sailor who by this act has made himself or herself really quite extra-ordinary, as he or she contributes to the sum total of human knowledge. And if the Blue Planet Odyssey achieves only this, we can be proud of this legacy left behind, these little buoys bobbing along or diving deep into the oceans for years to come, and sending back through the airs little bits of data that add to other bits of data to provide the building blocks of what we need to know about our planet, of what is happening to the climate and to the ocean, on whose balance and health we depend for our very lives. The drifter buoys were hand delivered to the boats in Key West by Shaun Dolk of NOAA who is directing the global drifter program. The buoys were then distributed amongst the rest of the fleet in Panama. It was time to deploy the drifter buoy that we had taken on board in Panama. It had been sitting under the cockpit table looking like some alien from Dr. Who but now we needed to get it out, unwrap it and get ready to cast into the water. We yachties are heavily reliant on good weather forecasts so it’s in our own interests to contribute to that result and it’s thanks to Cornell Sailing that we were able to do so. 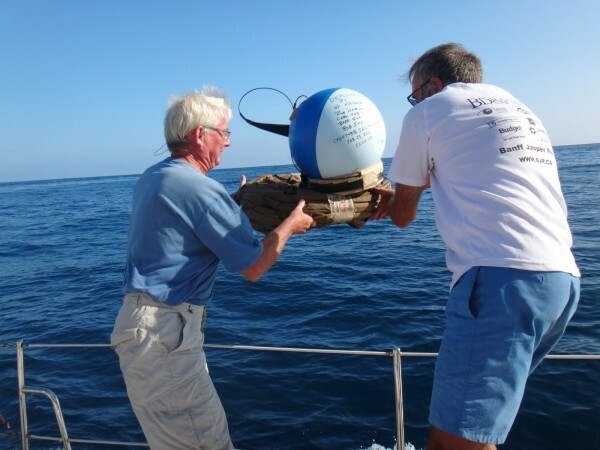 At about 88 degrees longitude we deployed our drifter buoy. This is a weather recording station that sends reports to NOAA. It will track such things as water temp and currents as it drifts in the Pacific. Each boat will deploy theirs at a different location. The position of each can be viewed online. The Atlantic has good coverage from commercial boats but the Pacific not as much so cruising boats are important in their deployment. It was quite large and heavy to be stored in the cabin so we were happy to have an opportunity to deploy it early in the trip! Hello Rally Control! Drifter buoy deployment at 99°W was a success. “Paddy” (it is St. Patrick’s Day) drifter buoy was successfully deployed. Floated happily away in the rain. We celebrated St. Patty’s day with the deployment of the NOAA drifter buoy we’ve been carrying since Key West. Ours was tossed over board to do its job at a longitude of 108 as instructed. Kind of miss stubbing my toes on what looked like a sombrero for a small giant and which was stationed on the inner port corner of the boat trampoline. It is the day to deploy our scientific drifter buoy for NOAA. Our boat has been assigned to drop the buoy anywhere along the 121 longitude. It will be sad to see it go because it’s been with us since January 10th when we departed from Key West, Florida. With a permanent marker, the entire crew signed the top of the buoy along with the boat name of Chapter Two. We can watch the progress of the buoy and view its travels through the ocean. It’s exciting to play a part in saving our oceans. Sailing yacht Libby, crewed by Terry and Dena Singh, took onboard eight Argo floats in San Diego from the Scripps Institution of Oceanography. There is a substantial gap in Argo coverage along 5°S in the eastern Pacific. The Argo floats had to be deployed in a specified line along 5°S which was something of a challenge for a small sailing boat. 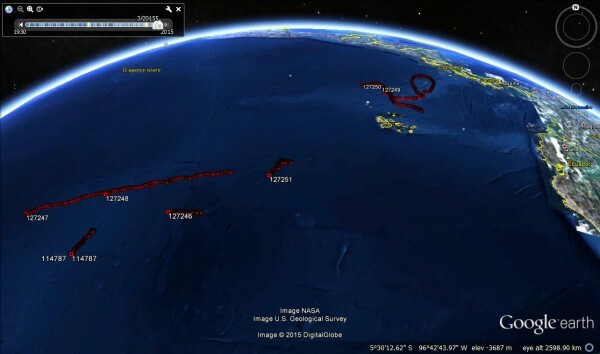 Terry and Dena enlisted the help of Chris and Jess on OM who are participating in the Pacific Odyssey and they each took four floats to deploy. Libby and OM arranged for each of the Argo floats to be adopted by a School or organisation. We deployed our 1st Argo Float in the wee hours of the morning today. This one was dedicated to Wildcat Mountain Elementary School (the school following Libby) and had written all over it! Only 180 miles to the next one! Libby deployed Argo Float #8339 tonight at approximately 6pm. Looking forward to an exact target as we apparently need 3 of those in a row to have a chance.